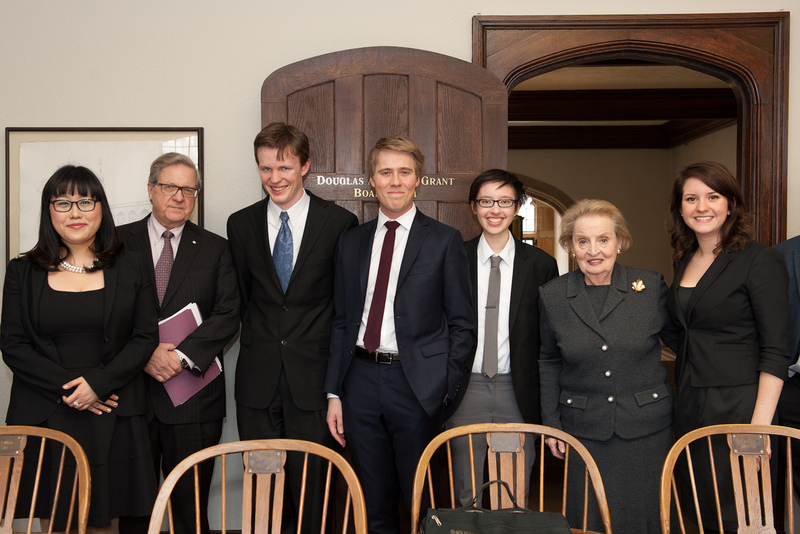 On April 1st, 2014, at the Seeley Hall of Trinity College, University of Toronto, the Canadian Centre for the Responsibility to Protect and the Bill Graham Centre for Contemporary International History co-hosted a student panel discussion featuring Dr.Madeleine Albright, the 64th secretary of state of the United States, and Dr.Lloyd Axworthy, former Minister of Foreign Affairs of Canada, chaired by Hon. Bill Graham, Chancellor of Trinity College. Four students from the University of Toronto served on the panel: Ms.Hope Caldi, Mr.Misha Boutilier, Ms.Rachel Gunn and Mr.Patrick Quinton-Brown. 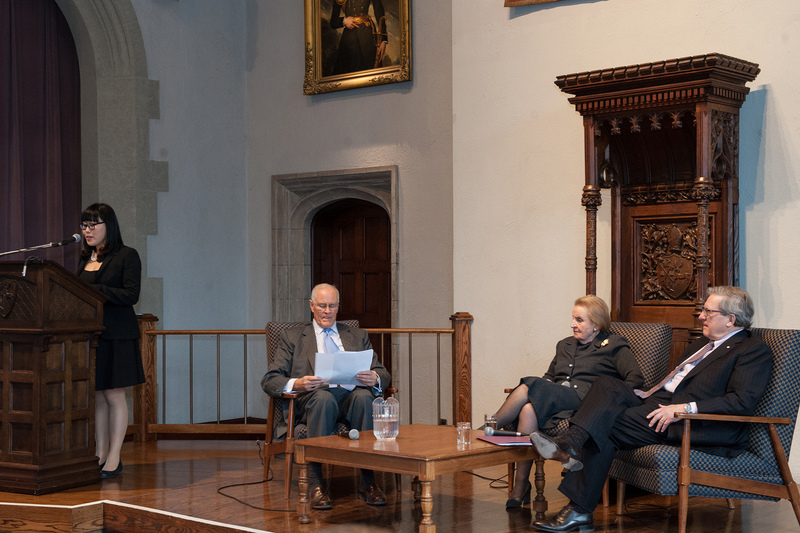 Dr.Albright and Dr.Axworthy reflected upon the lessons learned from the Rwandan Genocide, failures of humanitarian interventions in the 1990s, and the future of global humanitarianism. This event attracted over 150 students and faculty at the University of Toronto and served as an integral part of the Rwanda20 campaign co-hosted by the CCR2P and the Bill Graham Centre to commemorate the 20th anniversary of the Rwandan Genocide. 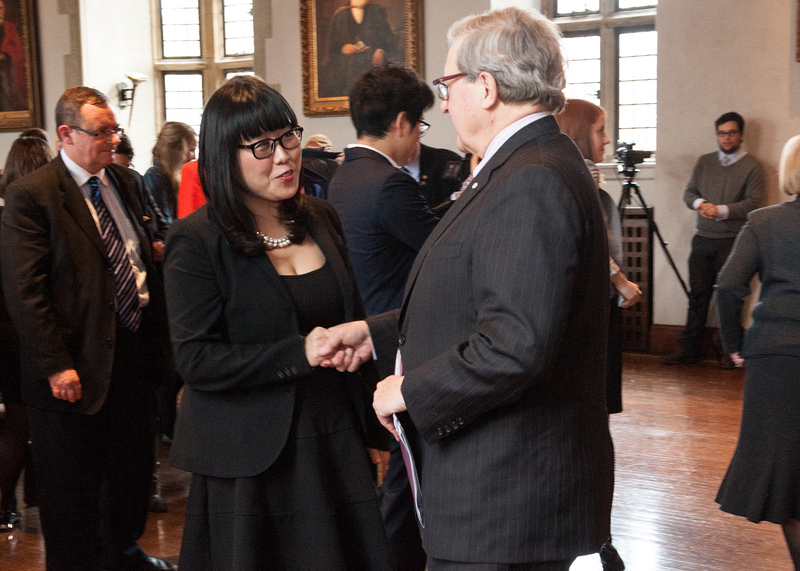 Click here for the coverage by the University of Toronto’s Media Relations Department. Below, please find a full text of Tina’s welcome address. On behalf of the Canadian Centre for the Responsibility to Protect and the Bill Graham Centre for Contemporary International History, I am delighted to welcome you today for our student panel discussion here at Trinity College. 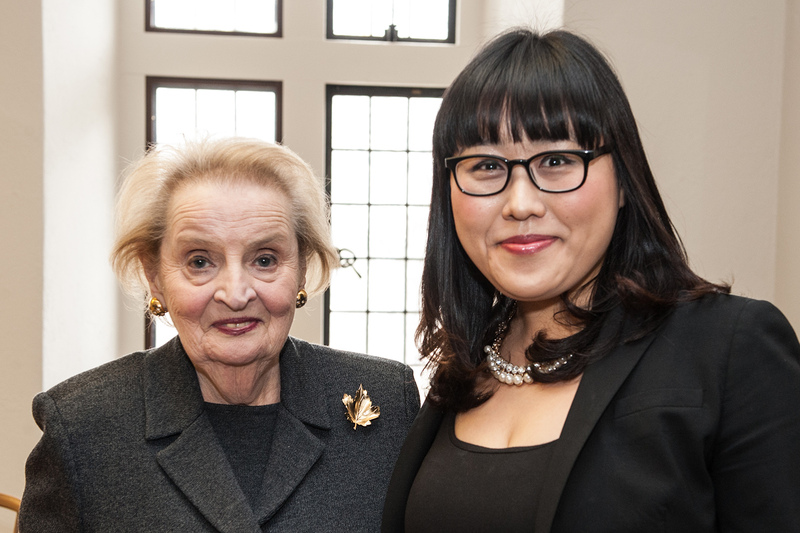 My name is Tina Park and I am a co-founder and executive director of the Canadian Centre for R2P. 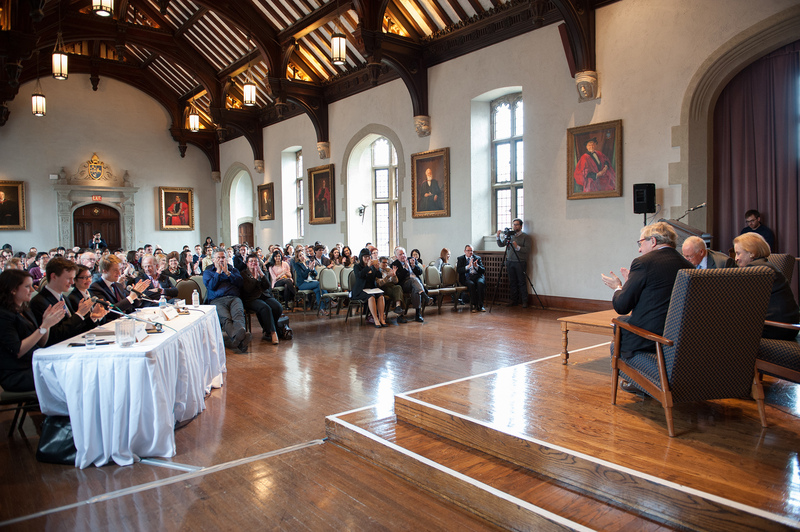 Based at the Munk school of Global Affairs, the Canadian Centre for R2P is mandated with promoting scholarly engagement and political implementation of the Responsibility to Protect principle. As a leading non-profit and non-partisan research organization for R2P in Canada, we currently have over 80 students working in our research and advocacy wings. We have also recently advised the Inter-Parliamentary Union on their resolution on the role of parliamentarians in enforcing R2P. With the International Relations Programme at Trinity College and the Bill Graham Centre, we have recently launched a campaign this spring to commemorate the 20th anniversary of the Rwandan Genocide and reflect upon the past, present and future of the R2P principle. Through our campaign, we hope to reflect upon our pledge of “never again” in our efforts to curb mass human atrocities and discuss how we can make the responsibility to protect a living reality in the 21st century. In addition to the full-day conference last Saturday, our campaign consists of a film festival, a youth and education outreach program to high schools in Toronto, and a publication project with the Canadian International Council’s OpenCanada, featuring reflections by twenty prominent Canadians on the lessons learned from the Rwandan Genocide. 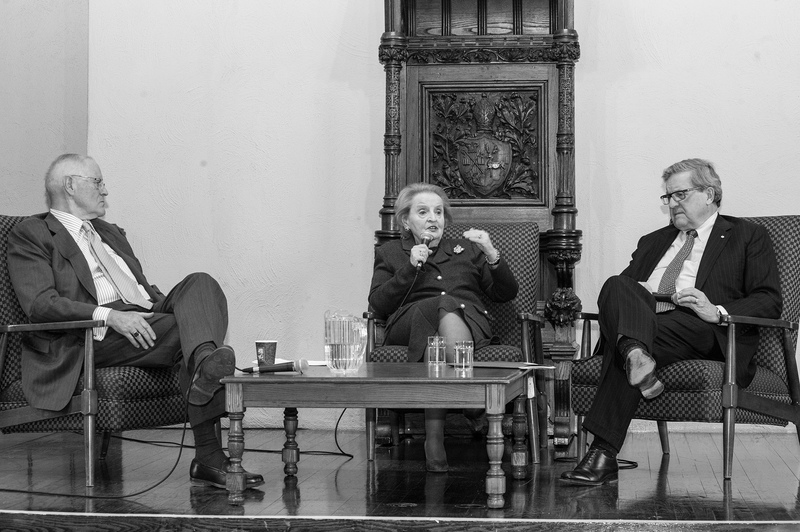 Today’s panel discussion is an important part of our campaign as we engage in dialogues with two very distinguished guests, Dr.Albright and Dr.Axworthy, who have made enormous contributions in the promotion of global humanitarianism. We are honoured that they could share their insightful ideas with the students at the University of Toronto and are extremely grateful of their time and dedication. Now, I am delighted to introduce our Chancellor, Honourable Bill Graham, to you, who will be chairing today’s panel discussion. A graduate of Trinity College, Chancellor Graham was first elected as a Liberal MP for Toronto Centre-Rosedale in 1993 and served the Toronto Centre until 2007. He also served as a chairman of the standing committee of the House of Commons on Foreign Affairs and International Trade. He served as the Minister of Foreign Affairs from 2002 to 2004 and subsequently as the Minister of National Defense from 2004 to 2006. In February 2006, he was appointed as the Leader of the Official Opposition. Prior to entering politics, Chancellor Graham had a very distinguished legal career. After earning his law degree at the University of Toronto as the Gold Medallist, he pursued a doctorate in law in Paris. As a partner in Fasken & Calvin in Toronto, he practiced litigation and international commercial law, primarily in Europe, Africa and the Middle East. In the 1980s, he taught international law at the Faculty of Law here at the University of Toronto. 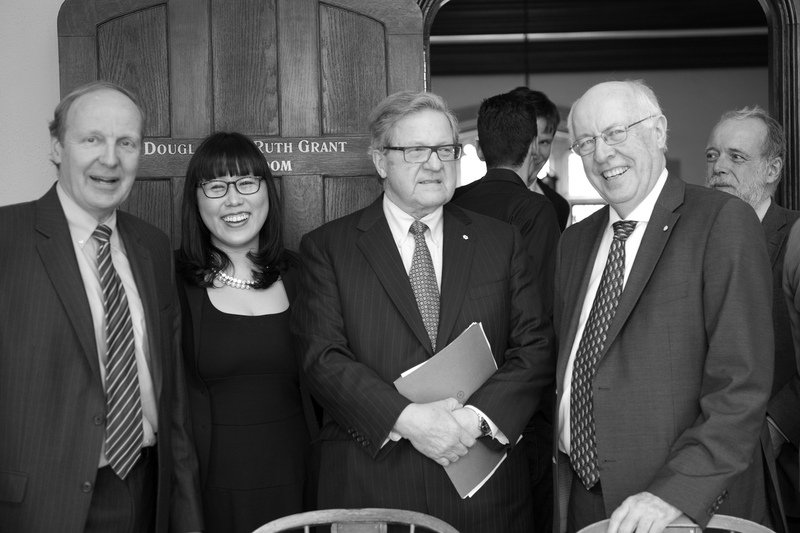 As the Chancellor of Trinity College, Professor Graham has been an exceptional mentor to many of our students and a generous supporter of our international relations program, the Canadian Centre for R2P as well as the newly launched Bill Graham Centre for Contemporary International History. Without further delay, please join me in welcoming Chancellor Graham to the podium.